Diagnostics of cancer concerning type and origin is, together with cancer stage and some specific tumor characteristics, the most important factors for treatment selection. Most cancers are diagnosed using a microscope. 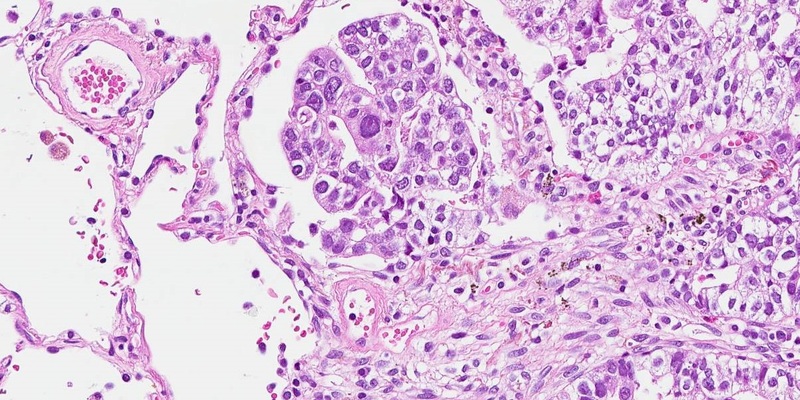 Pulmonary cancers may be tricky to diagnose as there is often limited tissue to examine from the tumor sampling, and immunohistochemical analyses are often necessary for subtyping and determination of origin of the tumor. The most common types of lung cancer are treated differently, as are metastases to the lungs from other organs, which is common. The aim of my research is to improve the diagnostics of lung cancer and metastases to the lungs so that more patients get a certain and specified diagnosis. Also, the aim is to find new prognostic markers in lung cancer and colorectal cancer metastasizing to the lungs to better stratify which patients that may gain from intensified treatment. Micke, P., Botling, J., Mattsson, J. S. M., Maria Planck, Tran, L., Halla Vidarsdottir, Björn Nodin, Karin Jirström & Hans Brunnström, 2019 Dec 1, In : Scientific Reports. 9, 1, 1319. Anna Karlsson, Helena Cirenajwis, Ericson-Lindquist, K., Hans Brunnström, Reuterswärd, C., Mats Jönsson, Ortiz-Villalón, C., Hussein, A., Bergman, B., Vikström, A., Monsef, N., Branden, E., Koyi, H., de Petris, L., Micke, P., Patthey, A., Behndig, A. F., Johansson, M., Maria Planck & Johan Staaf, 2019 Mar 26, In : Scientific Reports. 9, 1, 5207. Edlund, K., Madjar, K., Mattsson, J. S. M., Djureinovic, D., Lindskog, C., Hans Brunnström, Koyi, H., Brandén, E., Karin Jirström, Pontén, F., Rahnenführer, J., Micke, P. & Hengstler, J. G., 2019 Feb 9, In : Journal of Thoracic Oncology.